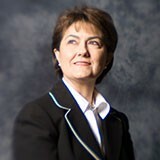 Anna Sugi was born in a small town in Apulia, the southern region of Italy colloquially known as the “heel of the boot.” She immigrated to southern California in the 1980s where she began work as a front office clerk, eventually working her way up to group administrator and partner of one the largest medical groups in the area. She demonstrated by example the power of work ethic and commitment to others. In 2009 she was unexpectedly diagnosed with an aggressive form of triple negative breast cancer. She is survived by her husband and children Mark and Michelle. Anna was deeply committed to her community and served as the founder of the Today’s Woman Foundation. She believed in the power of education and independence and despite her tireless work schedule, she always made time for others in their time of need.